Our families deserve more than "mostly water." 300 feet of residential water wells. 2 miles of Little League fields, county parks, churches, and daycare facilities. 2.5 miles of an elementary school. 5 miles of thousands of residences, and the largest Boy Scout camp in East Texas. 7 miles of over 100,000 residences, and one of the largest shopping malls in East Texas. Commercial waste under intense pressure will be injected underground passing through the Gulf Coast Aquifer to depths exceeding 6000 feet on property that includes abandoned oil wells that date back to the 1930’s. Old corroded well casings that come in contact with the waste zone will be conduits for toxic waste to be driven upward into our fresh water aquifers due to excessive formation pressure. Expert engineers from the state (TCEQ) and the applicant (TexCom) differed in reservoir modeling for the cone of influence (zone of underground impact) by almost 10,000 feet. The state engineer came up with models ranging from 150 feet to 10,000 feet, and was unable to confirm a definitive impact. The TexCom geological expert testified that his findings were totally different from every other geologist who mapped the site, including Exxon geologists who have managed the site since 1932. Expert engineers, chemists, geologists, and toxicologists living and working in Montgomery County have gone on record saying the site fails the established EPA criteria for Class 1 injection wells. To date, there is no consensus by the experts about the well’s ability to be operated safely. The permits, will allow operation of Class 1 commercial injection wells for 30 years. No one knows who will be managing or operating these wells 1, 5, 10, or 30 years from now. Dr. Ross, CEO of TexCom has made no commitment of how long they plan to own or operate these wells. Not one, single employee, manager, or officer of TexCom, nor any of their subsidiaries has ever operated or managed a Class 1 injection well. Mr. Robert May, managing partner of Foxborough Energy, LLC (a 60% owner of TexCom), has been twice named in lawsuits for failure to comply with the Federal Clean Water Act. One case was dismissed on a technicality, and the other was settled by Mr. May. 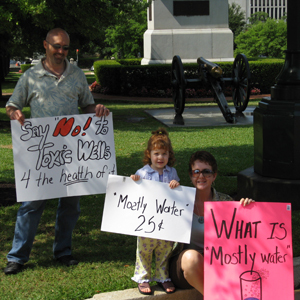 The TCEQ’s current policy of “self-monitoring” is unacceptable when the consequences of a well failure compromises the entire water supply for Montgomery County, the 26th fastest growing county in the U.S. Additionally at risk is a portion of the water supply for 53 other counties, including the city of Houston, the 4th largest city in the U.S. The financial burden of ensuring that the recommendations made by the State Office of Administrative Hearings in contested case hearings are in place and in force should not be on the people of Montgomery County. Nor should it be at the discretion of the applicant. It should fall squarely on the agency which is mandated and funded to ensure compliance by the Texas State Legislature, namely the TCEQ. An article appearing in the Houston Community News Online on 8/26/08 outlines how ineffective TCEQ fines are in providing adequate funding for repairing failed well damages, or to compel operators to follow safe standards. The people of Montgomery County, which includes all residents, business owners, city and county elected officials, as well as state legislative representatives for our area, unanimously oppose the permit application for operation of Class 1 injection wells on the proposed site in our county. The economic health and growth of Montgomery County, the 26th fastest growing county in the country, is inextricably tied to the protection of our precious water supply. For more information on our fight to defeat these permits, click on the following link….. Thank you for your support. As a community, we can band together to fight this and protect our right to safe drinking water.